It encapsulates a Controller method that was defined with C_ATTR macro, it's usually automatically created by Cutelyst::Controller using it's introspections information, this class allows Cutelyst to call a Controller method. You can access the object for the currently dispatched action via c->action(). See the Cutelyst::Dispatcher for more information on how actions are dispatched. Definition at line 47 of file action.h. Constructs a Action object with the given parent. Definition at line 25 of file action.cpp. Returns the value attribute by it's name, if not found dafault value is returned. Attributes can be defined using the C_ATTR macro on Controller's method declaration. Definition at line 87 of file action.cpp. Referenced by Cutelyst::CSRFProtection::checkPassed(), and Cutelyst::DispatchTypeChained::expandAction(). Returns the attributes that are set for this action, like Local, Path, Private and so on. This determines how the action is dispatched to. Definition at line 81 of file action.cpp. Referenced by Cutelyst::CSRFProtection::checkPassed(), Cutelyst::DispatchTypeChained::expandAction(), Cutelyst::RenderView::init(), Cutelyst::DispatchTypeChained::inUse(), Cutelyst::DispatchTypeChained::list(), Cutelyst::DispatchTypePath::registerAction(), Cutelyst::DispatchTypeChained::registerAction(), setAttributes(), setupAction(), Cutelyst::DispatchTypeChained::uriForAction(), and Cutelyst::DispatchTypePath::uriForAction(). Definition at line 99 of file action.cpp. Referenced by Cutelyst::CSRFProtection::checkPassed(), Cutelyst::Dispatcher::dispatchers(), and Cutelyst::RenderView::RenderView(). Definition at line 105 of file action.cpp. Referenced by Cutelyst::Dispatcher::dispatch(), Cutelyst::ActionREST::doExecute(), setController(), and Cutelyst::DispatchTypePath::uriForAction(). Referenced by Cutelyst::Controller::_DISPATCH(), and Cutelyst::Dispatcher::forward(). 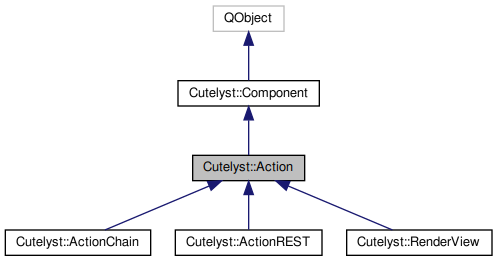 Reimplemented in Cutelyst::ActionChain, Cutelyst::RenderView, and Cutelyst::ActionREST. Definition at line 149 of file action.cpp. References Cutelyst::Context::detach(), Cutelyst::Context::detached(), and Cutelyst::Context::setState(). Referenced by Cutelyst::ActionREST::doExecute(), and Cutelyst::RenderView::doExecute(). Definition at line 111 of file action.cpp. Can be implemented by action class and action role authors. If the method exists, then it will be called with the request context and an array reference of the captures for this action. Returning true from this method causes the chain match to continue, returning false makes the chain not match (and alternate, less preferred chains will be attempted). Definition at line 121 of file action.cpp. Definition at line 35 of file action.cpp. Definition at line 131 of file action.cpp. Returns the number of args this action expects. This is 0 if the action doesn't take any arguments and undef if it will take any number of arguments. Definition at line 137 of file action.cpp. Referenced by match(), and Cutelyst::DispatchTypePath::uriForAction(). Returns the number of captures this action expects for Chained actions. Definition at line 143 of file action.cpp. Referenced by Cutelyst::DispatchTypeChained::list(), matchCaptures(), Cutelyst::Context::uriFor(), and Cutelyst::DispatchTypeChained::uriForAction(). Defines the Actions attibutes that were defined using the C_ATTR macro on Controller's method declaration. Definition at line 93 of file action.cpp. Referenced by Cutelyst::ActionChain::ActionChain(), and Cutelyst::DispatchTypeChained::registerAction(). Definition at line 53 of file action.cpp. Referenced by Cutelyst::Controller::_DISPATCH(), and Cutelyst::ActionChain::ActionChain(). Definition at line 40 of file action.cpp.